For consumers looking for masterful sound and unparalleled visuals, Onkyo & Pioneer Corporation has the perfect solution as the company today announced the details of its new 9.2-Channel network AV receivers: the VSX-LX504 and VSX-LX304 and Home Theatre Package: HTP-076. Featuring 7.2.2 channel / 5.2.4 channel surround sound with Dolby Atmos® and DTS:X®, the VSX-LX504 and VSX-LX304 are 9.2 channel receiver with plenty of power with 215W/ch (LX504) and 185W/ch(LX304) amplification (6 ohms, 1 kHz, THD 10 %, 1ch driven). These powers can also be directed through new Powered Zone 2 and Zone 3 outputs to enjoy audio from speakers in another room. Zone 2 Pre output has also been added for consumers utilizing a dedicated amplifier in Zone 2. These Zone 2 Pre outputs are also used as Zone B Line output to extend sound of Zone A(Main Zone) in other location or wireless headphone via transmitter. The VSX-LX504 and VSX-LX304 are Pioneer’s first IMAX Enhanced* AV receivers, featuring DTS:X immersive audio decoding that is optimized to properly reproduce the full dynamic range of IMAX® theatrical sound mixes available in IMAX® Enhanced content. With meticulous adjustments modelled on the IMAX theatrical sound system, this proprietary IMAX audio mix is translated for home theatre environments and exclusively delivered using a special variant of the DTS:X codec technology to deliver the IMAX signature sound experience as the filmmakers intended in the home. Both models support device connectivity with HDMI inputs. The LX504 and LX304 feature 7 HDMI In / 2 Out and supports Ultra HD pass-through with HDCP 2.2, 4K / 60 Hz, Dolby Vision™, HDR10, HLG (Hybrid Log-Gamma), WCG (Wide Color Gamut) and Ultra HD upscaling (1080p to 4K). These three models also support "Dialog Enhancement", which makes it easy to adjust and listen to movie dialogue and music vocal. In addition, these models support "Personal Preset" which can save, recall up to three of input selector, favorite volume and surround setting. Reflex Optimizer enhances object-based audio reproduction from upward firing Dolby Atmos ‘enabled’ speakers. Works with the Google Assistant so you can turn up the volume, skip tracks, or stop the music on the receivers using an Assistant-enabled Smart Speaker or Smart Displays, like Google Home. Wireless connectivity includes Chromecast built-in, Apple AirPlay 2, Bluetooth®, DTS Play-Fi®, Wi-Fi® as well as FlareConnect™, Pioneer’s wireless protocol that mirrors any audio source connected to the receiver on compatible speakers in other rooms. Enjoy a limitless flow of music, sports, talk, and news entertainment from internet radio stations and online music services, including Amazon Music, Pandora®, Spotify, TIDAL, and Deezer. In addition to high-resolution sound source (192kHz / 24-bit) in FLAC, WAV, AIFF and ALAC file formats, DSD (2.8/5.6MHz/11.2MHz) and Dolby® TrueHD® files are also supported. Custom integration features common in Elite receivers including, IR in, 12 V Trigger out, RS-232c and a detachable power cable. The HTP-076 is 5.1 channel Home Theatre Package powered with 150W/ch amplification (6 ohms, 1 kHz, THD 10 %, 1ch driven). Dolby Atmos and DTS:X playback is delivered via 3.1.2 channel speaker layouts. Object-based audio places sound where it would occur naturally in space, creating a lifelike audio experience for movies and games. In case of adding Dolby Atmos-enabled speakers, Pioneer’s unique Reflex Optimizer technology optimizes the performance of Dolby Atmos-enabled speakers for clear sound imaging at the viewing position. The HTP-076 supports two new surround technologies…Dolby Atmos Height Virtualizer** and DTS Virtual:X. These breakthrough technologies simulate the output from ‘virtual’ height and surround speakers if they are not physically present in a room. This allows for much greater flexibility when it comes to installing Dolby Atmos and DTS:X speaker set-ups. The HTP-076 features 4 HDMI In / 1 Out and supports Ultra HD pass-through with HDCP 2.2, 4K / 60 Hz, Dolby Vision™, HDR10, HLG (Hybrid Log-Gamma), WCG (Wide Color Gamut) and Ultra HD upscaling (1080p to 4K). 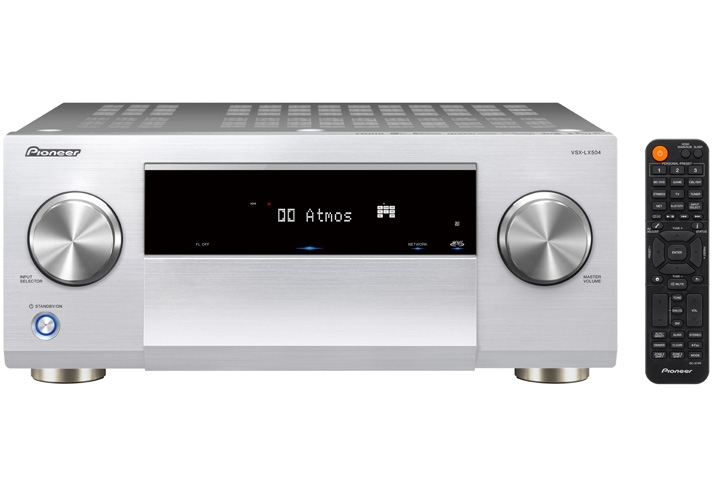 Like other Pioneer 2019 AV receivers, Bluetooth wireless technology is incorporated into the HTP-076. Pressing the “BLUETOOTH” direct key on the front panel lets you start the BT function, even when the receiver is in stand-by mode. The HTP-076 also supports “Dialog Enhancement", "Personal Preset" and “Zone B Output” for daily comfortable use.